Every business owner is a dreamer, steeped in the belief that they can be, create, and deliver the very best. A new ad campaign from Dell Technologies and Y&R New York shows them how they can build a solid, vibrant reality from the magic of their dreams. "Let's Make It Real" is the first major campaign for newly formed Dell Technologies, now the largest enterprise technology company in the world. The series of four television spots feature Jeffrey Wright, star of the HBO series Westworld. Tom Hooper, director of feature films including the Academy Award-winning "The King's Speech," directed. "Magic is pretty amazing," Wright says in the first spot, from his seat at a lavish performance theater, where a toad is transformed into a prince. "It can transform a frog into a prince, and sadness into 'happily ever after.' But it can't transform your business." Then, from center stage, Wright highlights the work of Dell Technologies clients, transporting viewers via life-size, projection-mapped images and models to a hospital room, which technology has transformed into a global diagnostic network; an airplane hangar, housing a jet now powered by engines able to self-diagnose and send alerts about problems; and a dairy in India, where cows transmit their habits and health data by text message to farmers. 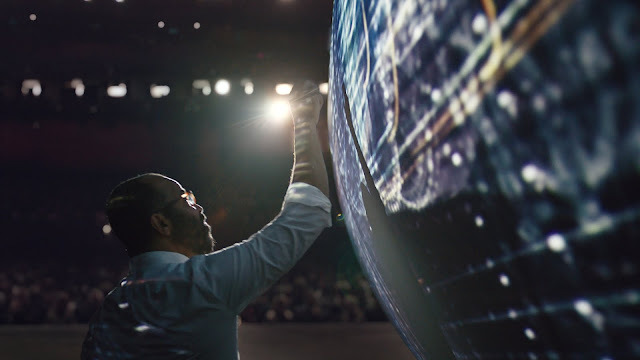 Each element in each of the television spots was chosen to demonstrate the Dell Technologies approach, down to the use of the projection mapping technique - creating complex visual effects using on-set, in-camera projection mapping technology - rather than the quicker, more common post-production CGI. "We used projection mapping to bring some tangibility and create a visual language for all that Dell Technologies does and all the technology at work around us," says Christian Carl, Y&R's Global Executive Creative Director "Let's Make It Real" is an invitation to customers to bring us their toughest problems and biggest challenges, so we can work together to make what might sound like fantasy, or the impossible, a reality,"